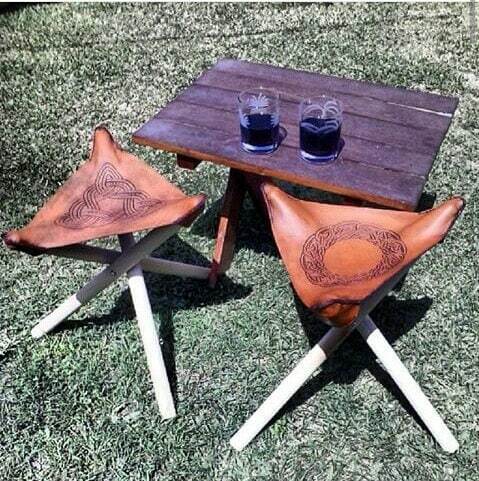 This hand crafted set of leather stools easily folds for storage or travel! Great for keeping on hand when you need a couple extra seats for a party or take with you for fishing, camping or hiking! Comfortable seat conforms to your shape and is like one of the most comfortable saddles you have ever sat in! Genuine veg tan cowhide top hand tooled with your custom design. Thick, sturdy pine legs fit inside hand stitched leather pockets on underside for quick, easy assembly- sets up in seconds! Top Measures approximately 16 in (40.5 cm). Legs measure 24 in (61 cm). * Customize with your image or pattern! Send your specified image in JPEG or PDF format.